Back in 2013, the last time I upgraded my anchor Mac system, it occurred to me that an 11-inch MacBook Air might be a potential substitute for both my laptop and iPad in one compact package. The 11-incher didn’t have a dramatically larger footprint than my iPad 2, but would run the full OS X operating system, real multitasking, file level directory access, support external pointing devices as well as having standard USB ports for I/O convenience, which pretty much covers my list of iPad/iOS shortcomings. However, I ended up buying a 13-inch MacBook Air, and subsequently replacing the iPad 2 with an iPad Air 2, sticking with the two-device setup I’ve been using since 2011. I found that as thin and light as the 13-incher is, it was still too cumbersome to be practical as an iPad surrogate for mobile computing. The iPad Air 2 is delightfully quick, but unhappily Apple didn’t choose to address any of the issues I listed above with it or iOS, and aside from speed, RAM capacity, and a cavernous 64 GB SSD, the Air 2 differs little in basic functionality from the 2011 A5 powered iPad 2. For my purposes a smaller Mac laptop would make a lot of practical sense as a crossover device. Consequently, the headline for a column last week by Gigaom’s Mark Crump caught my eye: “How I manage my creative process on an 11-inch MacBook Air.” Hey, there was somebody who’s given the 11-inch MacBook Air concept a real-world trial. Crump explains how he’d gone shopping for a replacement for his ailing 2009 MacBook Pro with a 13-inch MacBook Air in mind, having pretty much ruled out going with the 11-inch model, figuring the transition from a 15-inch to a 13-inch screen would be challenging enough. However, he found that when compared hands-on to the 11-inch model, the 13-inch MacBook Air felt “almost obese,” and he wanted a laptop he could toss in a carry bag and be productive with, anywhere. In the end, he walked out of the store with an 11-inch MacBook Air under his arm, and rhapsodizes that he’s finding that with it as a platform, managing his creative process has never been easier. He says not only did he adjust to the smaller screen very quickly, but also finds the little MacBook Air a lot speedier than he’d expected, noting that it runs “World of Warcraft” better than his 2011 15-inch with its dedicated GPU. Moreover, he’s finding the smallest Air as portable as he had hoped, and is enjoying having a light and portable device that he can get work done on without having to make the many compromises he would using any iPad. Crump says he’d taken a long look at the potential for going 100 percent iPad for his mobile needs, and had considered buying an iPad Air 2 and a keyboard case, but he still wasn’t comfortable going all-in on iOS, noting that the deciding factor for him was the lack of some sort of file-level access — at least something like an iCloud Drive app in which he could choose what app he wants to open a file with, and have the app save the file back to iCloud when he’s finished. So he went with the 11-inch MacBook Air, although he says he wonders if it will be the last MacBook he buys. However, that was before Apple unveiled the new 12-inch MacBook on Monday, and I’m wondering if Crump is experiencing a bit of buyer-remorse for not waiting. Or maybe not. There’s a $400 price difference in the base models. That said, I think, at least provisionally, that the 400 bucks worth of extra value is there provided the new MacBook is as good as Apple says it is. While the file level access issue looms huge for me, and is a show-stopper when it comes to tasks like uploading images to a WordPress CGI, I also need the real multi-windowed multitasking that remains a no-show in the iOS. I’m still hoping Apple will come around, and there is speculation that multi-windowed multitasking and even mouse support will be baked into an iOS version to support a 12-inch iPad “Pro” model rumored to be in the works for release later this year, along with perhaps a USB-C port like the one on the new MacBook that would support data transfer, video-out, charging and peripherals connection all via a single connection, opening potential for an array of productivity capabilities not possible with current iPads. Given that line of speculation, an operative question for current production-oriented iPad Air and Air 2 users like me is whether the iOS component of those much-desired features will support our 9.7-inch machines. Having just spent north of Canadian $750 (with taxes) on this iPad Air a few months ago, I’m not feeling jolly about shelling out more than that for a larger iPad in order to get the features I need any time soon. Much would depend on how the larger tablet is priced. If an entry level version can be offered matching the base Microsoft Surface Pro 3 at $799, that would leave a substantial $500 spread between the bigger iPad and the MacBook. However, if the iPad Pro runs much more pricy than that, I think it will have some serious competition from the $1,299 MacBook, and among users for whom cost is a significant issue, it’s hard to envision many ponying up for both a 12-inch MacBook and a 12-inch iPad. In that saw-off, the MacBook would be the clear value and functionality choice even for a couple or three hundred dollars more, leading some to suggest already that the larger iPad may be in trouble from in-house cannibalization before it’s even released. 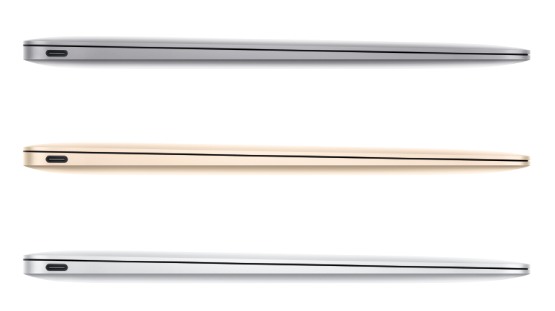 As for the MacBook Air, while the new MacBook is making me feel some pangs of upgrade-itis that have been entirely absent over the 18 months since I bought the Haswell 13-incher, the older machine is still a great value with more power and capability for less money if portability is not your top priority. Personally, I think Retina displays, while nice to have, are over-hyped for those of us who are not graphics or video professionals — basing that evaluation on back to back use of my non-Retina iPad 2 and my Retina iPad Air 2. 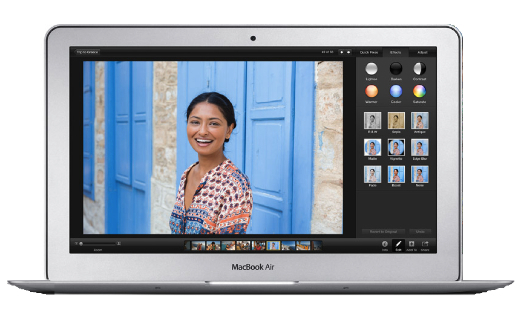 I don’t feel cramped or inhibited by the non-Retina 1,440 x 900 resolution of my 13-inch MacBook Air. The Air still has the advantages of two standard USB ports and a ThunderBolt port that you won’t have to buy a bunch of expensive adapters for in order to connect your hard-wired peripherals, a dedicated MagSafe charging port (MagSafe, a proprietary Apple innovation is not supported by the USB-C standard), and a SDCard expansion slot (on the 13-inch model), faster CPUs and more powerful graphics support. The 13-inch Air also outpaces the new MacBook in battery charge life by a factor of about one-third, and the 12-incher matches the new machine’s nominal nine-hour rating. Somewhat eclipsed in the hoopla Monday over the Apple Watch and 12-inch MacBook announcements was a nice update for the MacBook Air Apple also today updated the 11-inch and 13-inch MacBook Air including Broadwell fifth generation Intel Core processors processors clocked at up to 2.2 GHz, with Turbo Boost speeds up to 3.2 GHz, Intel HD Graphics 6000 IGPUs, Thunderbolt 2 delivering up to 20Gbps — twice the bandwidth of the previous generation T-Bolt — and what Apple claims is two times faster flash memory for the 13-inch model. There’s plenty of life in this four and a half year old design yet, and a case to be made that it’s still the best all-round laptop value Apple has ever offered. So for now at least, I’m going to be happy with my 13-inch MacBook Air/iPad 2 Air tag-team as I watch to see how things unfold. If history is any guide, the MacBook’s price will drop after the early-adopter spike flattens out. An imponderable as yet is how long Apple will continue offering the old MacBook Air and whether a rationalization will eventually result in a single line of of sizes Apple laptops of a range of sizes simply called “MacBook” with more iOS/OS X convergence. The best news this week, IMHO, is that Apple is anything but through with laptop innovation and the ‘Book Mystique is alive and healthy.